The sound of the gavel hitting the desk top is one of the sweetest sounds in my world. As I was sitting having my breakfast this morning, gazing out into my peaceful back yard my mind got to wandering, as it often does these days. If you would have been inside my head the sound of my thinking would have been likened to a pinball bouncing off the rubber bands and dinging the bells. My thoughts flittered around looking for a place to land. For some reason, they landed on auctions. Might have been something I read or saw or heard or none of these things. Auctions. The mere word gets me excited. My dad has always been a bartering kind of guy. He often came home from the bar on Friday night with a new acquisition. One time it was a row boat with a hole in it and that's when we all learned how to fiber glass. I'm pretty sure he traded that boat for my first car, a 1957 Hillman Minx. It was a beauty. The clutch however, was a problem. So much of a problem that my dad insisted if I was going to drive it that I would have to learn how to change the clutch (which went every 3-4 months). Aside from the clutch, the windshield wipers flew off at random and we had to park on a hill in case it wouldn't start. I was a master of the clutch-popping car starting method. Anyway, back to the topic at hand. I don't remember my parents (my dad in particular) ever paying full price for anything. I was slightly embarrassed one time when we were in Sears and my dad bargained with the salesman for a coffee table with a slight scratch in it. To my surprise my mom and dad bargained the price down to something they could afford and hauled the table out to the station wagon to take home. My embarrassment didn't stay with me, my love for bargaining, however, did. In my early teen years we moved to Comox, B.C. Aside from the magical beaches, stunning mountains and year round recreation, there was an auction. To be precise, the Cumberland auction. We used to jump into the car on Friday nights and head to the small village with the big auction (where my future husband resided little known to me at the time) . The Ilo-Ilo theatre had long disappeared and in its place was the famous home of the Friday night auction. My parents picked up their paddles and headed to different spots in the theatre. I think my mom was sometimes perplexed by the things that caught my dad's eye so they seldom sat together. One of my favourite things in the world was to watch my dad bid on the cardboard boxes labelled 'various items'. Now, to be honest, you could go into the auction ahead of time and preview the items, including the cardboard boxes and their contents. Pretty sure my dad found it much more exhilarating to bid on the unknown. I completely understand the fun in taking that box home and digging through it hoping to find some magical item that you didn't know you needed or wanted. On one of those Friday nights my parents did the usual, picked up their paddles and headed in opposite directions. I often didn't sit with either of my parents and just hung out watching the fun from my own spot on the sidelines. During one frantic bidding session I realized that my parents were bidding against each other and before I could catch the attention of either one of them my dad had outbid my mom. When she realized what had happened she was NOT happy. As usual, this didn't bother my dad a bit and in fact probably made it that much more fun for him. Honestly, I cannot remember one thing we brought home from those auctions but what I do remember are the sights, sounds and musty smells of that old theatre and its contents. I remember it usually being a pretty cheap evening of entertainment. I remember the smile on my dad's face and the puzzled look on my mom's face when she realized what they had spent their hard earned money on. I remember being a people-watcher and loving the exciting atmosphere of the auction. If you think my dad's bargaining skills were saved for Sears and the auction though you are wrong. Along the road between Courtenay and Comox sits a well known seafood stand known as Portuguese Joes. You can even buy a t-shirt there that says, "I got my crabs at Portuguese Joes". I've seen these t-shirts from Fernie to Agassiz so Joe had a good idea I guess, even though it didn't appeal to me. When my dad got a hankering for a good shouting match he used to pull in at PJ's. As our car pulled into the parking lot I swear I could see a smile twitching at the corners of Mrs. Joe's mouth. My dad made his entrance, checked out the display case and always started with, "I'm not buying any of that old stuff, where's the fresh fish?" Mrs. Joe got outraged and the party was on. After 15 minutes of insults and yelling between Mrs. Joe and my dad, my dad would pick up his fish, let out a loud laugh and we'd be on our way home. I'm sure Mrs. Joe loved to see our car in her parking lot. 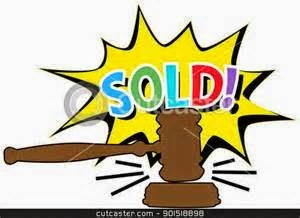 Since those early days auctions have always grabbed my attention. Mostly I just like to watch the people and the things they buy but sometimes I like to buy as well. One of my favourite auctions was always the auction on the Saturday night of the Agassiz Fall Fair. Any entries that weren't picked up from the craft, baking, jam etc. exhibits are auctioned off at the end of the day. It was a family affair for us (minus my husband who was usually watching a Yankees game). I loved it that Bob Ford auctioned the pumpkins in increments of 5 cents. He ALWAYS made sure that every child there got a pumpkin to take home. He was also acutely aware of how to pander to his audience. A loaf of bread, a dozen eggs and a jar of jam was always 'tomorrow morning's breakfast'. A bunch of potatoes, carrots, celery etc was always a 'tasty soup in the making'. Bob knew how to make the auction fun and inclusive. For me, he always made sure he yelled 'SOLD!' at just the right time so I got a bottle of wine and a bunch of prize-winning flowers. When Bob passed away his son Rob took over and the tradition continued. We have so many fond memories of packing a box into the car (to bring home our goodies) and heading over to the hall about 7:00 after a day of visiting, reminiscing, eating corn and chicken and just hanging out at the fair. We tried the auction a couple of times after a new auctioneer took over from Rob but it just wasn't the same. Chilliwack hosted a great auction for a few years but those too have gone the way of the dodo bird. I tried another auction in Chilliwack but it was antiques and the buyers were serious and the prices were beyond my idea of 'having a little fun at the auction'.